The 43-year-old lost the opening set but bounced back from his 9-5 setback to capture the second set 10-5. 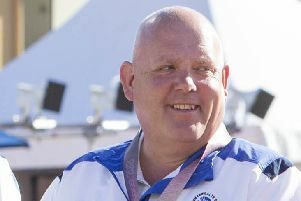 Walker is no stranger to experiencing pain in the final of major events having lost in the finals of the national singles of 2008 and 2011 while he lost a World Championship semi-final in 2013. Both players had impressed on their way to the final but Walker dominated the scoring in the tie-break to win it 2-0. He had lived dangerously to win by a tie-break in his last-16 match against Mike Stepney of Elgin, then went on to beat Joe Mower (East Lothian) and Darren Weir of Prestwick. Caroline Brown of Blantyre completed a successful defence of the Ladies Scottish Masters with an 8-5, 8-5 victory over Carla Banks of Garioch. • The Alex Marshall Arena in East Lothian is one of the venues for the National Fours Championship, however the home rink of Jamie Higgins, Scott Kennedy, Billy Mellors, and Derek Oliver are headed for Inverclyde. The reigning champions face Cowal in the prelim round and, for company on the same 9.30am session, have their female counterparts Dee Hoggan, Mags Thomson, Yvonne Veitch, and Janet Fairnie who face East Kilbride. The Balbardie ladies and gents also travel to Inverclyde with Betty Johnston, Kim Ross, Sharon Leitch, and Lorraine Craig tackling Allander in the first round while the unnamed gents rink face Falkirk. The East Lothian venue hosts the Midlothian gent’s rink of Neil Melrose, Willie Melrose, Jimmy Cullen, and Colin Walker who open against Fintry in the prelim round. Also there will be the West Lothian IBC rink of Bryan Cooper, Dougie Mitchell, James Speirs, and Neil Speirs with Mitchell replacing Thomas Mann in the line-up that won the title in 2011 and 2015. WL start at 9.30 am against Stirling in the first round, however it is a 2pm start for Bainfield challengers Daniel Gormley, Craig Paterson, Paul O’Donnell, and Robert Marshall who face Teviotdale. The women’s rinks involved at EL are, Heather Stoddart, Kate McVey, Anna Anderson, and Mandy Jenkin (Bainfield); Sandra Muir, Elle Borthwick, Stacey McDougall, and Shona Johnstone (Midlothian); Sandra Purdie, Alison Brown, Jean Brown, and Jennifer Sneddon (West Lothian). 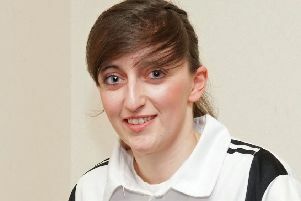 • The 40-strong line-up for the Ladies International Trial at Arbroath on Sunday, December 2 includes eight players across the Lothian clubs; they are: Dee Hoggan, Janet Fairnie, Yvonne Veitch, Emma Logan (East Lothian); Stacey McDougall, Megan Grantham (Midlothian); Lorraine Craig (Balbardie); Wendy Purdie (West Lothian). • Play in the Gents Premier League saw Midlothian suffer their first defeat in four having been the latest visiting team to be mauled (87-72) by the defending champions in the Lions’ Den at Blantyre. Midlothian do retain top spot however in the B Division as they have six points to the five of Blantyre and East Lothian, with Bainfield on four. East Lothian got back onto a winning track with an 89-60 win at home to Bainfield with the outcome never in doubt following a 19-shot lead being built up from a strong opening spell. The major contribution came from the rink of Aaron Betts, Alex Cormack, Jamie Higgins, and Scott Kennedy over their former colleague James Hogg. Billy Mellors weighed in with a 14-shot triumph over Robert Marshall while a double at the last saw Derek Oliver edge a single-shot win over Paul O’Donnell. Joe Mower though did lose out by five shots to John McDermott. West Lothian’s revival in the A Division was cut short by their 88-74 at Lanarkshire and that leaves them with just two points, languishing in the bottom three with Aberdeen (2) and Elgin (0) for company. • East Lothian Seniors lived extremely dangerously on away territory before escaping from Teviotdale with a 60-59 victory, a result that keeps them top of the East B table- by two points from Midlothian. The other fixtures played this week resulted in West Lothian beating Bainfield (62-45) at Livingston and Balbardie defeating Tweedbank (81-53) at Bathgate.